We recently had the chance to review a Wickless Candle from ScentSationals. 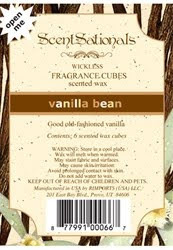 "What is a ScentSationals Wickless Candle? 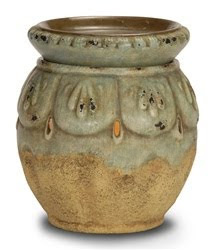 ScentSationals' unique wickless wax warmer combines light, fragrance and artistic design to create a unique, personalized ambiance in any room. A soft 25w light nested within a decorative ceramic vessel provides enough heat to melt wax fragrance cubes in a dish at the top of the warmer. Our unique warmer/wax combination creates a relaxing, decorative atmosphere while acting as a safe heat source to melt ScentSationals Fragrance Cubes, ﬁlling your home or office with a wonderful aroma. Our highly scented custom waxes provide a rich experience at a fraction of the cost of other scented waxes. We offer a wide variety of scents from tropical getaway to holiday nostalgia, floral bouquets, and fresh from the bakery. For the latest in fragrances browse our online catalogue, or check your local retailer for the current scents. Be sure to check back often as we are continually adding new scents to reflect the current seasons and trends. We are confident you will find the perfect scent to customize your home or office. • Affordable - Our melters and waxes cost less than the competition, yet offer the same great quality. • Beautiful - Decorative styles for your home or office. • Variety - We have more than 50 different scents to choose from, and are adding new ones and retiring old ones all the time." "New and improved, this beautiful design is back with a new look. We've antiqued the finish and made it look like an ancient artifact discovered in the ruins of ancient Greece. Our decorative wickless candle warmers use a safe 25 watt bulb to melt highly fragrant wax cubes. Each warmer is approximately 6.5 inches tall by 5 inches wide (exact dimensions may vary slightly). Warmers use a standard 120 volt wall outlet as their power source, and feature an on/off switch built onto the power cord. The wax melting tray is removable, making it easy to change fragrances and for simple clean up." 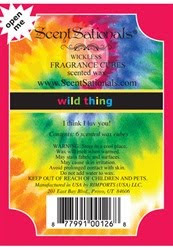 "Our famous fragrance Wild Thing! This fragrance is a burst of juicy fruit mingled with a touch of wild lavender, it'll "make your heart sing". Sweet aromas of creamy French vanilla paired with hints of fresh coconut, hot buttered rum, and a touch of cocoa. The comforting essence of sweet cinnamon, warm clove, and fresh nutmeg accented with subtle nuances of fresh basil and eucalyptus invite back memories of home and family. Our highly scented wax comes in a 6 cube-tray. Generally, only one cube is needed at a time to fill your space with fragrance (this of course depends on the size of the space, larger rooms/homes may use more). The low melting point and wickless, no-flame features of our wax make it safe for use in your home or office." What we thought: I love my wickless candle from ScentSationals! It was beautiful and they really have a nice variety of styles...something for everyone's decor:) The waxes were wonderful as well. They melted quickly and really made the whole house smell wonderful. The Wild Thing scent was fruity and sweet, the No Place Like Home reminded me of holiday cooking and the Vanilla Bean smelled just like the ice cream of the same name:) I guess my only problem was getting hungry each time we turned the warmer on:) We are really loving our beautiful warmer and our affordable waxes(which last quite a while, btw!) ABCD Diaries gives ScentSationals an A+! 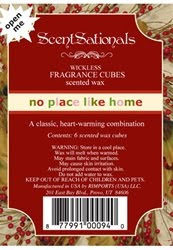 Buy It: Find these beautiful wickless candles at ScentSationals!! Win It: ScentSationals has generously offered one ABCD Diaries reader the Antique Greek Wickless Candle warmer and the 3 waxes we reviewed! To enter, follow our blog via GFC and comment below. Giveaway ends Tuesday, March 29, 2011 at 11:59cst. Winner will be chosen via random.org and emailed. They will have 48 hours to reply. Open to US residents 18+:) No PO Boxes. I entered kaz e cup. I love princess and the pea. "Liked" ABCD Diaries via Facebook. I follow on gfc. Thank you! I've been wanting to try one of these, but I haven't gotten to yet. I also entered the Otterbottle tote giveaway. I think the Coconut Sun scent would be nice. Also entered the TagsMania giveaway.